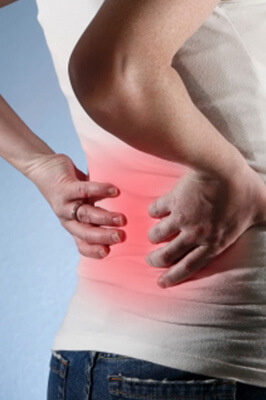 Acute and chronic back pain can be debilitating and due to a range of conditions. Pain may be felt in upper, mid or low back, rib cage or shoulder girdles. But the suffering is often needless, as here at Orchard we can successfully treat back conditions leaving you pain free. We perform a structured, detailed assessment to localise where the pain is coming from. We will analyse your body movements to detect underlying causes which may not be directly obvious. Weak core/back muscles, or tight hip, knee and shoulder muscle can be affecting other areas, such as spine and back pain. Poor posture or body alignment can cause excessive strains in the back. We will offer corrective advice and prescribe dedicated exercise routines to correct posture, spinal alignment, plus workplace ergonomics. Treating with these methods will result in the spine moving more freely, will enhance strength and stability, and will stop lower back pain. We provide ongoing advice and exercise to help you maintain your back’s health and stop recurrence. Neck pain can be caused locally or can arise from other problems in the spinal joints, discs, ligaments and muscles. Your neck muscles spread out from the neck to attach to the upper eight ribs, shoulder girdles, skull and jaw bone. We therefore assess areas of tightness, weakness, inflexibility, poor posture or alignment of your neck, even poor breathing patterns associated with any of these areas. You may also experience headaches arising from the neck, which is a direct referral from joints and muscles. Through detailed discussion and examination, we will review the neck’s flexibility, strength and postural alignment. We look at possible underlying causes, such as carrying heavy bags on the shoulder causing muscles to tighten, or poor lower back, head and jaw alignment. Treatment may include manual therapy, joint mobilisation, manipulation, soft tissue massage or stretching. We will teach you how to correct your trunk, shoulder and neck posture and alignment to stop compensations and the resulting strain on the neck. Long term neck pain with the correct teaching and advice offered by our Physiotherapists, is avoidable with strategies used to help yourself. Our knee strength, flexibility and alignment is vital to allow us to walk, stair climb, run and stand from a chair effectively. Knee pain can result from either direct injury, degenerative changes or biomechanical faults of movement in daily life and sports. Damage may occur to muscles, bursae, ligaments, tendons or cartilage of the knee (Tibiofemoral joint ) or knee cap( patella). 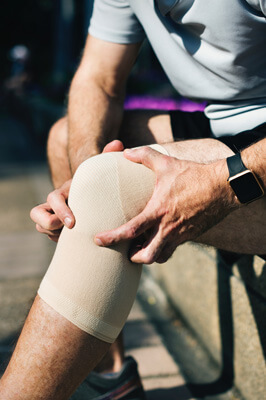 At Orchard Clinic we analyse the way you walk, run or move, not just in the knee but throughout the body to see if this may be an underlying cause of knee pain. 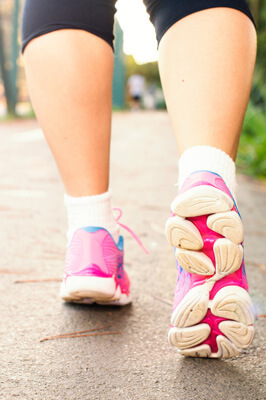 For example, certain foot postures may contribute to knee pain. We perform a detailed examination of the knee joint, cartilage, ligaments and muscles to find out the root cause of your knee pain. Treatment may include soft tissue massage, manipulation and stretching of knee muscle, ligaments, tendons and mobilisations to stiff knee joints. Taping and exercises will help support the knee and correct any alignment issues in relation to the rest of the body. Ultrasound can be used to treat soft tissue swelling and inflammation. Strengthening exercises are used to aid knee stability, which is important for those suffering with arthritic conditions or when aiming to return to sporting activities or daily life skills. Dependant on condition, a progressive exercise regime will be tailored for you to make your knee stronger and more flexible to stop knee pain. For further testing to diagnose knee conditions such as X-Rays, Scans etc, your Physiotherapist can advise and recommend the correct referral route as part of your treatment. One of the most common conditions we treat as Physiotherapists is back and neck pain. Some problems can simply be linked to our posture or how we move; whereas some spinal pain may have underlying pathology. Common pathology includes disc bulges, facet joint strains, spondylosis, osteoarthritis, osteoporosis and spondylolisthesis. At Orchard clinic we can often diagnose these problems or work with you if a diagnosis has previously been identified by means of an X-ray or MRI. We can help to alleviate neck, mid-back and lower back pain as well as associated nerve pain like sciatica. RSI is experienced as an over use injury which may be work related, sports related or leisure related, such as gardening or DIY. We will work closely with you to help identify the root cause of your symptoms. We will create a tailored treatment plan to rehabilitate and get you back to your work or activity. Neuralgia or trapped nerves can occur when a disc, bone or muscle places pressure on a nerve. The nerves in our body can get caught around structures such as spinal disc bulges, tight muscles and in particular conditions such as carpal tunnel syndrome. 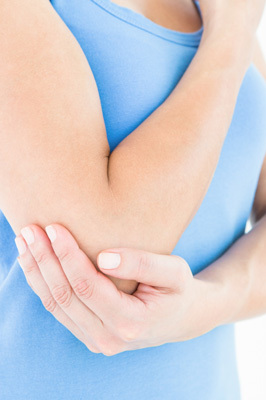 At Orchard clinic we will carry out an examination to find the cause of the trapped nerve. Once identified we will devise a treatment plan to relieve the pressure on the nerve and ease discomfort. Physiotherapy is strongly recommended for the treatment of muscle strains, tightness and imbalances throughout the body. For example hamstring / calf / groin strains, rotator cuff problems in the shoulder and neck pain. Treatment includes manual therapy techniques, taping, electrotherapy and acupuncture to help alleviate symptoms. We will develop an exercise program for you to continue using at home after treatment, to prevent further recurrence. 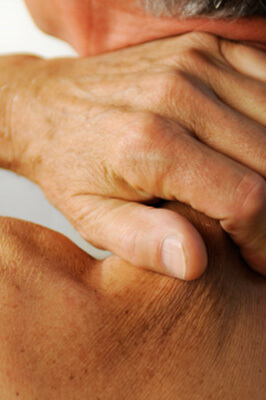 If you suffer with arthritis or other joint problems throughout the body, for example, hamstring / calf / groin strains, rotator cuff problems in the shoulder and neck pain, Physiotherapy can help to alleviate pain and stiffness in joints, whilst also building up strength in the muscles to help support the affected area. Physiotherapy is effective in helping conditions in the upper and lower body such as Osteoarthritis, frozen shoulder, impingement, jaw pain, cartilage problems or bunions. Manual therapy, soft tissue treatment and joint mobilisation are used to alleviate pain and increase movement. Prescribed exercise is recommended to increase strength in surrounding muscles. If you are experiencing acute or on-ongoing sports injuries such as pulled muscles, ligament strains, bursitis and shin splints, we can help to rehabilitate you back to your sport. We would work closely with you to identify any underlying triggers to your injury. We will implement longer term rehabilitation plans tailored to your needs to help prevent future re-occurrence. When appropriate, we can use video gait analysis to assess your running biomechanics. We are also able to advise on the need and use of orthotics. Following a detailed assessment, we will provide a tailored rehabilitation programme, including specific stretches and exercises and also any taping techniques or hands on treatment, in order to speed up your recovery. To prevent any recurrence of injury in the future, long-term rehabilitation programmes can also be provided following the identification of any altered biomechanics or weaknesses. Tendinopathy is a dysfunction in the tendon. It is a common problem and can often present in the forms of Tennis Elbow, Jumpers Knee, Achilles Tendinopathy, and De Quervains in the wrist (see our recent blog for further information). Our physiotherapy assessment will identify your condition. We will then recommend and implement the most effective treatment to resolve your pain. Treatments can include soft tissue release, taping, acupuncture, ultrasound, stretches and specific exercises called eccentric exercises. 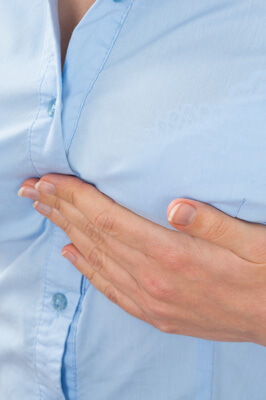 Chest pain can be experienced due to a dysfunction around the ribcage or middle back (thoracic pain). Also localised problems in the chest like pectoral muscle strains, rib fracture, muscle tightness following breast cancer surgery and costochondritis may cause pain. Following an initial assessment to identify the cause of pain, physiotherapy treatment will aim to restore function and ease pain. 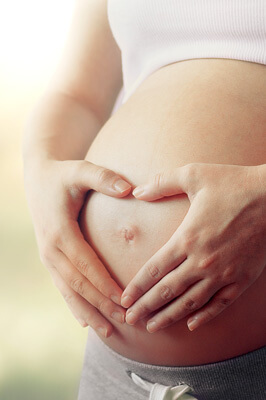 Some ladies may experience ante-natal or post-natal problems, for example Symphasis Pubis Dysfunction, separation of the Rectus Abdominus muscles and reduced core stability. Physiotherapy can help to ease symptoms through treatments such as bracing, manual therapy and prescribed exercise. You may be experiencing dizziness which is related to an inner ear disorder such as BPPV. Physiotherapy can help to alleviate these symptoms by using the Epley manoeuvre and practicing specific prescribed exercises, which can be very effective in the treatment of such conditions. Headaches can be experienced due to a dysfunction around the neck and shoulder blade (cervicogenic headaches). 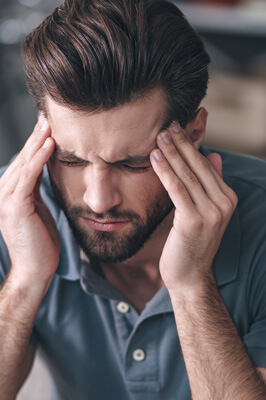 We will work with you to help address posture, joint stiffness, muscle tension and weakness, which can all contribute to cervicogenic headaches. Physiotherapy can be used to address post-trauma conditions such as Whiplash, fractured bones and recovery from falls. Physiotheraphy treatment will effectively help to reduce the pain experienced and ease restriction in movement that may be experienced after injury. 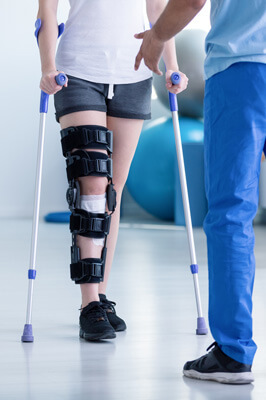 Physiotherapy is an effective treatment to help regain strength and movement after surgery; for example, after joint replacements or post-arthroscopy. The benefits will help guide you back to your normal level of function and lifestyle. A common condition experienced by many, is the suffering of aches and pains caused by postures in leisure activities or occupation, e.g. sitting looking at computer screens, driving postures or fallen arches. Our team will work with you to identify the imbalance causing the pain. The imbalance can be treated with soft tissue massage, joint mobilisation, acupuncture and taping. We will also prescribe exercise routines and postural advice to correct poor posture and prevent recurrence. Physiotherapy can benefit anyone who is looking to improve their general fitness and strength. This is particularly beneficial if you are struggling with walking or balance, or if you are recovering from either surgery or illness. Our team can assess and advise you of a programme to optimise your health.